This new diesel hydrostatic drive family achieves its durability and low costs of ownership from its rugged designs and field proven components. With Komatsu’s hydrostatic drive system, standard wet disc brakes, and Closed-center Load Sensing hydraulic system (CLSS), the FH series achieves reduced costs of operation and reduced maintenance costs. The FH series lowers your cost of operation in a variety of demanding, high-cycle operations. Also equipped with KOMTRAX—Komatsu’s exclusive information data management system. 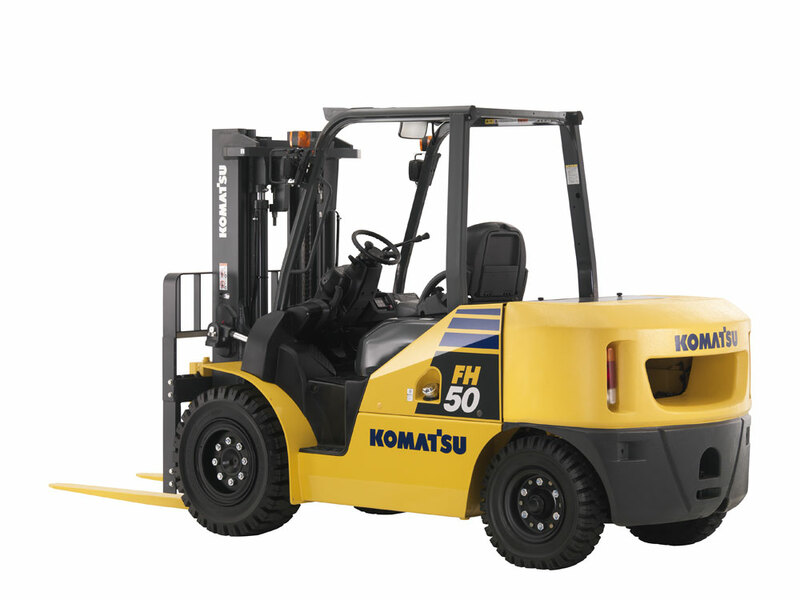 Now, when you buy a new Komatsu forklift the warranty runs for 5 years or 10,000 hours operation (Subject to Komatsu Forklift Australia warranty terms & conditions). Komatsu CLSS automatically detects the hydraulic load ensuring only the required amount of oil is supplied reducing unnecessary engine effort. 24 volt electrical components improve engine starting performance – even in cold regions the Komatsu FH will deliver smooth, consistent starting performance. High quality and Reliable Komatsu components. All of the Komatsu FH series main components such as the engine, hydraulic pumps, hydraulic motor, axles and controllers are designed, developed and manufactured by Komatsu. Komatsu Auto Engine Shutdown fitted standard. Environmentally advanced EPA Tier 4 Interim and EU Stage 3A emissions certified. KOMTRAX, a standard feature on the FH series, is Komatsu’s remote equipment and fleet monitoring system. Leading-edge wireless technology and a secure, user-friendly web-based application provide critical information…anytime, anywhere. KOMTRAX tells us where your machines are, what they are doing, and how they are doing it providing total fleet management capabilities for improved fleet utilization, reduced downtime and lower owning and operating costs. The Oil Cooled wet disc braking system can withstand approx. 10 years or 10,000hrs without maintenance.The wet disc brake system is sealed with oil to block dust penetration, providing durable, water resistant and fade resistant characteristics. Smooth, stable braking provides productivity and reliability in demanding operations. The oil in a wet disc brake system is circulated through the brake oil cooler. This mechanism ensures stable braking under a heavy work load and prevents deterioration of the braking force that could be caused by raised oil temperatures. Standard Travel Speed settings, 5, 8, 15 and 23.5 klm settings. Can change direction without releasing the accelerator pedal and without the switchback shocks of torque converter models. Rolling on ramps is controlled, preventing uncontrolled rolling back when stopped and enabling secure and smooth travel forward. This function prevents the starter motor from turning again if the key is turned while the engine is already running, protecting against ring gear wear. Komatsu’s CLSS hydraulic system has been utilized in our hydraulic excavators for many years. The load sensing capability automatically senses loading and the variable displacement pump then supplies only the amount of hydraulic fluid needed to do the job. This provides for much greater efficiency than conventional fixed displacement gear pumps, making good use of engine power to reduce overall fuel consumption. 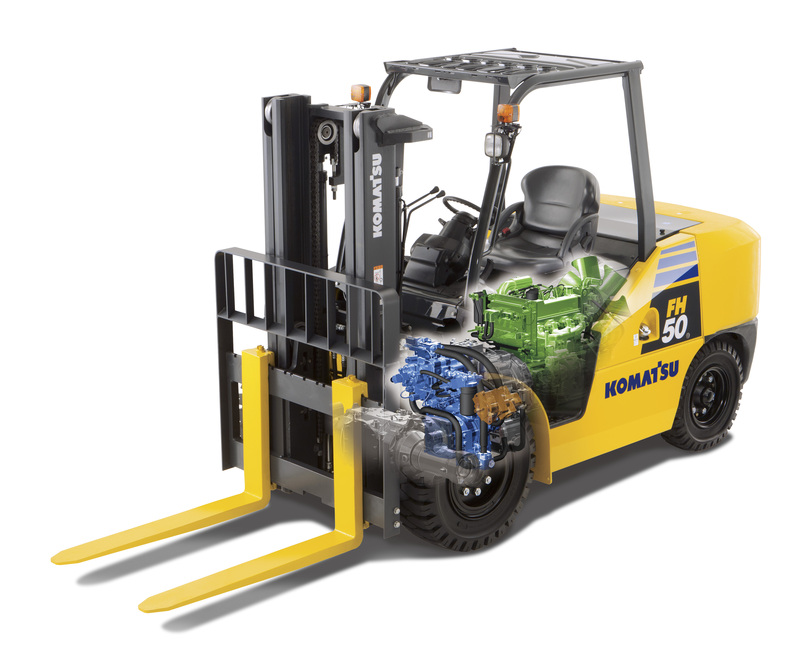 In the HST system, the diesel powered engine drives the pump and oil supplied from the pump then rotates the motor that drives the forklift. The power losses over the entire engine speed range are minimal. Since the HST system does not have a clutch, there is no possibility of heat loss or slippage. This means power transmission losses are minimized to reduce fuel consumption. 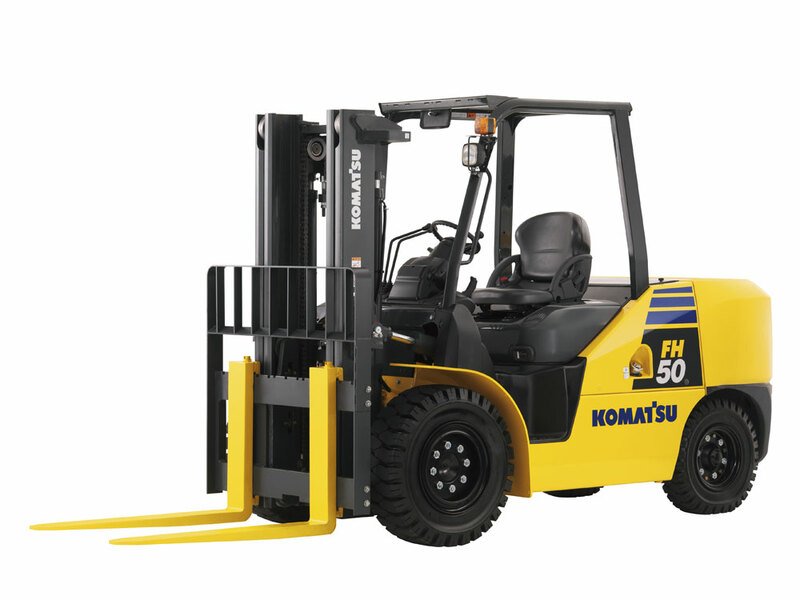 The FH series requires less inching pedal use because the HST forklift can adjust speed through the use of the accelerator pedal. Also with excellent controllability of the HST, the operator has better control when maneuvering in tight quarters, lifting, or load handling. Travel speeds can be set in for stages and activated with the turtle switch. 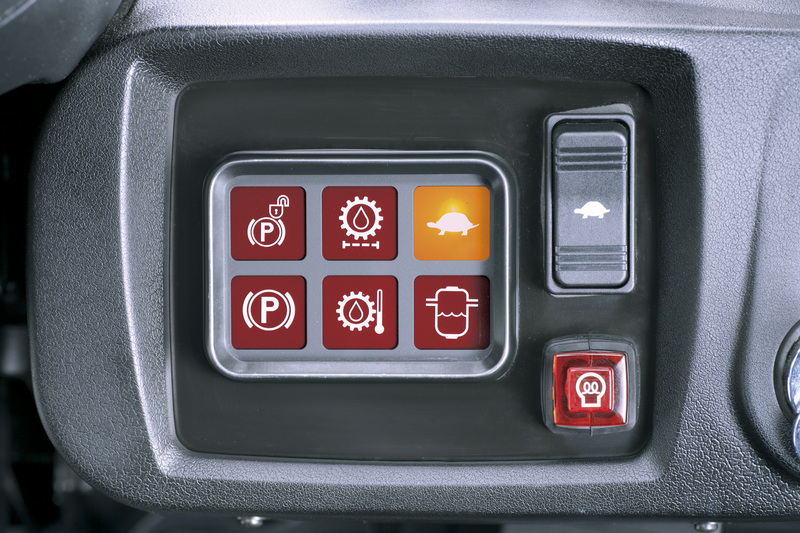 To eliminate inadvertent start-ups, the FH engine can only start when the shift lever is set to neutral, brake pedal depressed and the operator is in the seat. 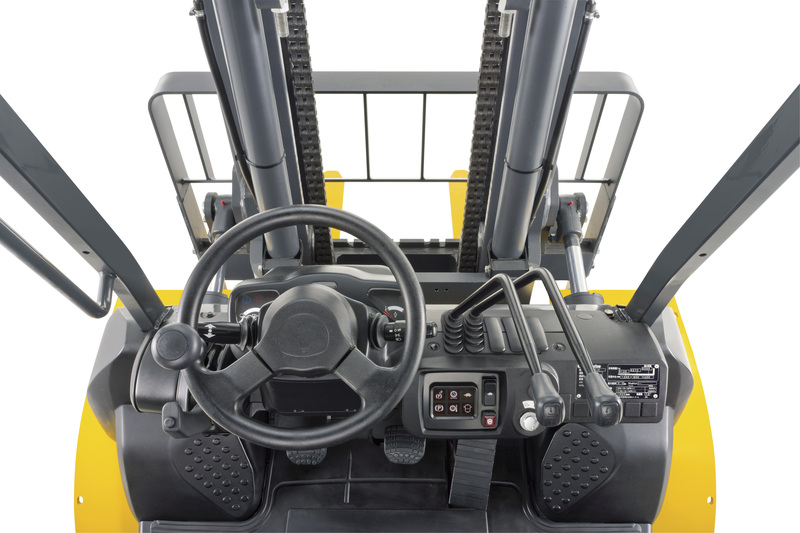 With HST drive, the oil flow to the hydraulic motor is stopped when the accelerator pedal is released, so even if the forklift is stopped on a ramp and the operator releases the brake pedal, downhill creep is reduced. This also facilitates easier ramp-start. 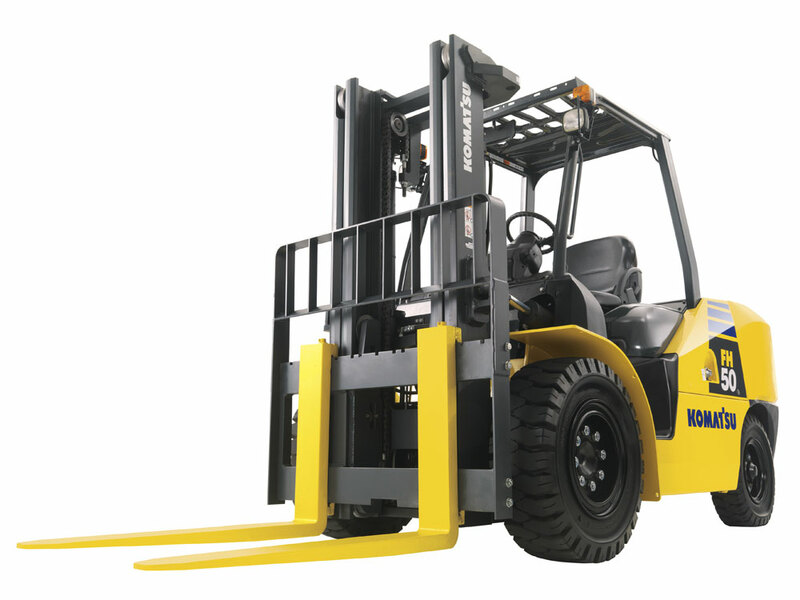 The feature ensures safe work by reducing speeds in tight spaces and keeping the forklift trucks within specific in-plant speed or environmental limitations. The FH series offers speed limiter settings for: 5 km/h, 8 km/h, 15 km/h, and 23.5 km/h. The travel speed limiter function can be switched on or off even while the machine is moving. Whether the travel speed limiter is on or off, the hydraulics speed remains the same. When carrying loads or traveling on slopes and unexpected deceleration occurs, a sensor will detect travel speed and maintain the preset speed. Administrators can only set maximum travel speeds. As a result there are both normal and maximum travel speed limits. This ensures safety when traveling between indoor and outdoor locations with different speed limits.